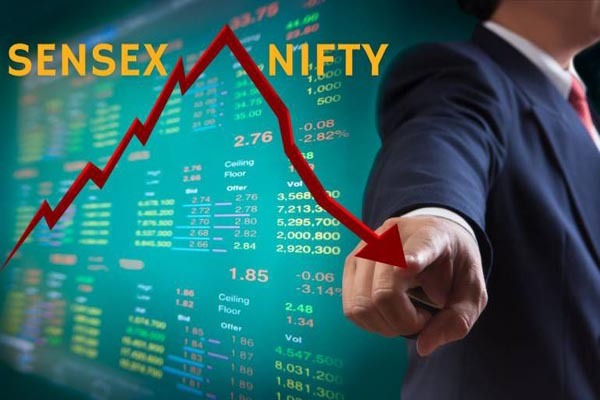 Mumbai(PTI): The BSE Sensex slumped over 179 points to end at 35,037.64 today after the rupee collapsed to a lifetime low against the US dollar amid firming crude oil prices. Participants also offloaded their long bets in futures and options (F&O) segment instead of carrying them forward to the next series for July, brokers said. The rupee plunged to a fresh record of 69.10 against the dollar in early trade today. Global oil prices have climbed to about USD 78 a barrel after the US asked its allies to end all imports of Iranian oil by November. Concerns over supply disruptions in Libya and Canada also pushed prices higher. The Sensex, which resumed lower at 35,207.19, continued its slide to crack the 35,000-mark and touched a low of 34,937.15 as selling intensified. However, it recovered marginally on value-buying and covering-up of short positions to end at 35,037.64 — down 179.47 points, or 0.51 per cent. The gauge had lost 272.93 points in the previous session. The broader NSE Nifty, after cracking the 10,600-mark, ended 82.30 points, or 0.77 per cent, lower at 10,589.10. Meanwhile, foreign portfolio investors (FPIs) bought shares worth Rs 67.44 crore on net basis, while domestic institutional investors (DIIs) also bought equities to the tune of Rs 84.31 crore yesterday, provisional data showed.